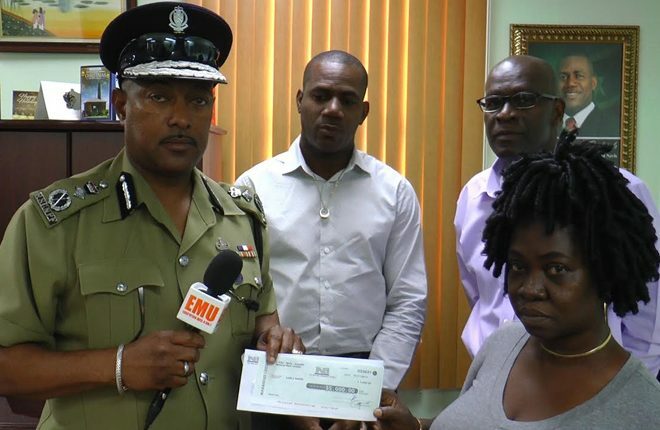 (ZIZ News) — A member of the Sandy Point community has received a cheque for five thousand dollars from the Sandy Point Benevolent Society after her home was recently destroyed by a fire. Carla Baker received the funds during a handing over ceremony on Wednesday in the office of the Deputy Prime Minister. Former President of the Sandy Point Benevolent Society, William V. Hodge explained how the funds were raised. “At the 6th Annual banquet of the Sandy Point Benevolent Society that was held here in St. Kitts at the Marriott, The Hon. Minister of Education made an appeal in his address to the banquet to get some support to offer to the victim Carla Baker and her family”, he explained. Deputy Prime Minister and Parliamentary Representative for Constituency #5, Hon. 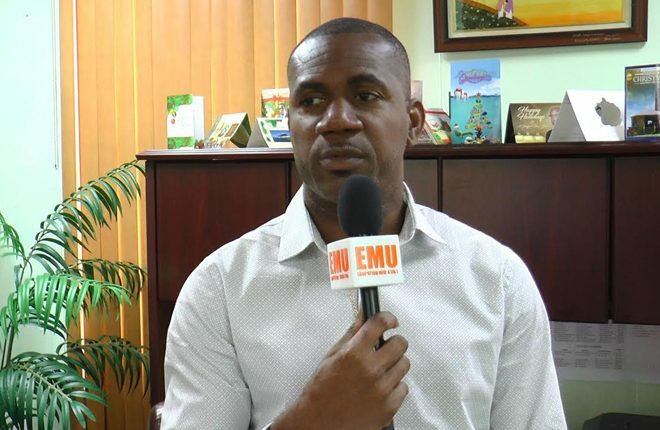 Shawn Richards said he was pleased with the swift response from the association. “I am thankful that the SPBS responded so quickly in coming to the aid of the family to some extent helping to ensure that the family is able to restore or regain some of the their possessions. Carla herself would have attended the Sandy Point High school and she is from the community and I think this is really what SPBS is about; giving back to the community.” the Deputy Prime Minister said. Vice President of the Society, Police Commissioner Ian Queeley made the presentation to the victim on behalf of the association. “On behalf of the chairperson Mr. Duggins I am pleased to hand over this cheque in the amount of $5000.00 to Carla Baker as a start to rebuilding. The minister would’ve explained in detail how difficult it is for persons to rebuild in the face of tragedy and SPBS is about giving back and giving back to help others go forward”, Queeley expressed. Baker then thanked everyone who assisted her family and said she was more than grateful for the donation. Carla Baker’s home in Sandy Point was destroyed in a fire on December 25, 2016.